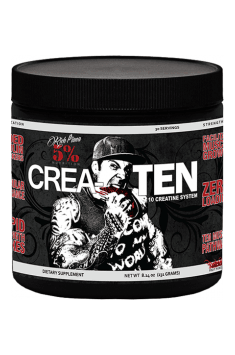 5% Nutrition Crea-Ten is a dietary supplement containing as many as ten different forms of creatine and a mix of substances facilitating its absorption. Such a blend ensures maximum muscle saturation with creatine. One bottle contains 231 g in a comfortable form of powder, available in several delicious flavours. Creatine is one of the most commonly used supplements both among people who do sports recreationally and among professionals. Creatine is naturally present in the human organism and can be synthesised from glycine and arginine; however, natural production might not be enough to satisfy the needs of a physically active person. Skeletal muscles are the main location of creatine storage but it can also be found in the cardiac muscle, brain, kidneys, and liver. In skeletal muscles, creatine is transformed into phosphocreatine by the enzyme creatine kinase. The same reaction can take place in the heart and the brain. Phosphocreatine is a compound with high-energy bonds, it provides a phosphate group for the formation of adenosine triphosphate (ATP). ATP is an energy carrier in the organism and ensures the delivery of energy to all locations where biochemical processes take place. When working, muscles use up large amounts of ATP, which is why supplementation with creatine guarantees the maintenance of energy processes on a high level. Research has demonstrated time and again that creatine increases strength, workout performance, and the physical capacity of the organism. Creatine promotes an anabolic environment, which increases the chance of building lean muscle mass. Creatine magnesium chelate – guarantees high bioavailability of creatine. It displays synergic activity, as magnesium, similarly to creatine, participates in energy processes in the body. It is a perfect combination for increasing the organism’s capacity. Creatine malate – a compound of creatine with malic acid. It is characterised by high chemical stability. Malate participates in the Krebs cycle, which is responsible for the formation of high-energy bonds. Creatine anhydrous – free of water molecules in its structure, thanks to which it does not increase the content of water in tissues. Also a highly stable compound. It is recommended for people who have to pay attention to weight limits, e.g., in martial arts. Creatine monohydrate – the most popular form of creatine containing one water molecule. It increases water content in cells and helps to nourish them better, that way supporting the process of muscle mass development. Creatine citrate – besides creatine, it contains three molecules of citric acid which are ionised and used as an intermediate product in the Krebs cycle. It ensures high stability in an acidic environment and can regulate intracellular pH. Creatine pyruvate – creatine combined with pyruvic acid, which is an intermediate product in sugar metabolism. Pyruvate is a substrate in the reaction of the Krebs cycle and quickly increases the level of available energy. Creatine ethyl ester (CEE) – displays great anabolic potential. Creatine ester ensures fast creatine absorption and is highly bioavailable, so its dosage can be lower than that of other forms. Creatine alphaketoglutarate – creatine combined with alphaketoglutarate, which is an intermediate product in the Krebs cycle. It ensures great bioavailability and reduces muscle protein degradation, that way supporting muscle mass development. Creatine ethyl ester malate – a modern form of creatine in which both compounds are esterified. The formula guarantees high stability and bioavailability, as well as exhibits anabolic and ergogenic potential. Creatine gluconate – a combination of creatine with glucose, which helps to transport creatine to muscles. Simple sugars stimulate the pancreas to produce insulin, which helps to provide muscles not only with glucose, but also with creatine. Taurine – a non-proteinogenic amino acid. It affects water and electrolyte balance in the organism and participates in the transport of creatine to muscles. Betaine anhydrous – a chemical substance naturally present in the organism. It improves cell hydration and increases workout capacity. It can increase the level of the anabolic hormone insulin-like growth factor (IGF-1) and reduce cortisol levels. Gymnema sylvestre extract – an extract of a tropical plant native to Asian countries, used in Ayurvedic medicine for over 2,000 years. It has the ability to maintain healthy blood glucose levels and supports the functioning of the cardiovascular system. Black pepper extract (BioPerine®) – the active substance is an alkaloid called piperine. It stimulates gastric juice secretion and increases blood flow in the digestive system. It helps the body to absorb nutrients more efficiently. Vanadium nicotinate glycinate chelate – contains a trace element, vanadium, which regulates blood sugar levels. It increases the transport of nutrients to muscles, exerting a positive effect on regenerative and anabolic processes. Banaba leaf extract – a source of ellagic acid and numerous tannins. It activates the glucose transporter type 4 (GLUT4), responsible for glucose transport to muscles. By activating insulin, it also increases the transport of creatine and other nutrients to muscle tissues. Fenugreek seed extract – contains dietary fibre, exerts a positive effect on the functioning of the digestive system and the kidneys. It has anti-inflammatory properties and increases insulin sensitivity. Additionally, the product contains chromium, an element responsible for many enzymatic reactions in the body. It supports glucose permeation to cells and regulates the level of the sugar in blood. It increases the organism’s immunity and helps to reduce adipose tissue. To sum up, 5% Nutrition Crea-Ten is a supplement that increases creatine levels in the organism in a complex way. It contains as many as ten forms of creatine as well as substances that facilitate the assimilation of nutrients. It increases glucose uptake in muscles, increasing creatine assimilability and transport in the body, which helps to maintain an anabolic environment in the organism. Dissolve one scoop (7.7g) in water or drink. It is recommended to take one serving immediately after training. It is recommended to take one serving during the day. The supplement facilitates the development of muscle mass by maintaining an anabolic environment; however, it is very important to remember about the right intake of amino acids and calories. The supplement is recommended for people who want to improve their workout capacity, boost energy, and increase muscle strength. It can be taken with a portion of protein or amino acids. In order to improve glucose uptake, the product can be taken with a meal rich with carbohydrates. Creatine anhydrous – a creatine compound without a water molecule and thus with much better absorption in the body. It belongs to advanced supplements which are expected to be highly effective in the body. It is designed for professional athletes who treat supplementation seriously. Creatine is one of the strongest dietary supplements which can be used legally in professional sport. It shows great anabolic potential due to its far-reaching effects in the body. The main one consists in increasing the utilisation of creatine as a substrate in the phosphate energy pathway. As a result, this supplement maximises the body’s energy efficiency in short-term exercise such as strength training or sprints. Enhanced energy metabolism helps provide stronger training stimuli which speed up muscle anabolism. However, creatine has also other mechanisms of action. As an inhibitor of myostatins, it eliminates factors which limit the growth of muscle mass. What is more, by boosting cell hydration, it optimises an intracellular environment and thus promotes processes of regeneration and development of muscle tissue. The Banaba leaf extract (Lagerstroemia indica), a plant used for centuries by the population of the Philippines to effectively regulate blood sugar levels. It has a slightly diuretic effect and helps to effectively reduce body fat. The raw material is a leaf Banaby containing acids (2a-hydroksyursolic [corsolic acid] and ellagic) and tannins. Corsolic acid is an activator of glucose (GLUT 4) operating insulin-like, facilitating the absorption of glucose and saturation of muscle cells. In the sports supplementation Banaba leaf extract is used as an ingredient in regulating insulin metabolism, supporting the reduction of body fat and improve the absorption of food by muscle tissue.